Congratulations to Graham Taylor on winning the 2015 Male Elder of the Year at this year’s NAIDOC Awards. An Amangu Yamatji elder, Graham was born in Three Springs and has made a strong contribution to the Australian Defence Force. He now mentors Indigenous youth as an inspirational leader and role model for young people. 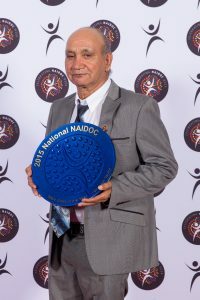 Graham has previously been awarded NAIDOC Elder of the Year in 2008. In 2012 he was also recognised, being elected into Western Australia’s Midwest Region Hall of Fame for his contribution to the region. To read more about Graham visit our latest edition of YMAC News here.